Britain’s next government must have the freedom to develop the NHS without legal challenges stemming from the Transatlantic Trade and Investment Partnership (TTIP), parliament’s business, innovation and skills committee has warned. In a scathing report examining the controversial trade deal’s implications for Britain, the cross-party committee of MPs called upon the government to produce harder evidence that TTIP could boost Britain’s economy by £100 billion a year. The committee also warned the government needs to make a stronger argument for backing the investor-state dispute settlement (ISDS), a clause in TTIP that would pave the way for private firms to sue governments in cases where national parliaments’ policies threaten companies’ profits. European and US negotiators have been embroiled in talks for almost 18 months to create TTIP – the biggest free-trade and investment agreement the world has ever seen. The ambitious agreement would strive to create a unified, single market of approximately 1 billion consumers. Covering half the globe, it will attempt to harmonize trade regulations and scrap tariffs from California to Bosnia. Following months of tense talks and numerous leaks of draft agreements, the trade pact remains the focus of bitter criticism. Accusations leveled at its architects include concerns over whether it will have the power to override domestic legislation, and concerns over whether secrecy shrouding the negotiations prioritize corporate interests over those of the public’s. Critics of the pact also warn the European Commission (EC) has sought to block EU citizens’ capacity to influence TTIP, despite the far-reaching effects the trade deal will have on citizens across the continent. Adrian Bailey, chair of the UK parliament’s Business, Innovation and Skills committee, said TTIP holds the potential to benefit the UK’s economy. However, he was sharply critical of the “dog whistle” politics adopted by opponents and supporters of the agreement. Bailey also denounced a lack of transparency relating to TTIP, negotiations for which are ongoing behind closed doors. “More detail needs to be made available to allow greater public scrutiny of this extensive trade agreement,” Bailey said. He went on to say that backers and opponents of TTIP should refrain from making unsubstantiated claims. “Campaigners, lobbyists, business groups, government and the European Commission also need to do more to engage with the evidence rather than make unsupported claims about the benefits or risks of TTIP,” he said. The committee’s sharpest criticism was directed at the Conservative-led government, however, which has long been resolute in its support of TTIP. The cross-party group of MPs argued it is virtually impossible to quantify “in any meaningful way” what benefits TTIP could bring to Britain. “Rather than continue to use the £100 billion figure, the government must come up with a comprehensive assessment which includes the estimated economic yield of a variety of levels of agreement,” Bailey said. The committee’s report also warned that MPs are “deeply concerned” by the government’s failure to offer an official response to the EC’s consultation relating to controversial ISDS provisions. “We are not convinced the case has been made for the inclusion of ISDS clauses and we urge the government to set out a clear statement guaranteeing the protection of public services at present – and the right to expand them in the future – is set out in any ISDS provisions,” the report said. The committee added that the UK government should, without exception, set the regulations regarding which firms can run NHS services. 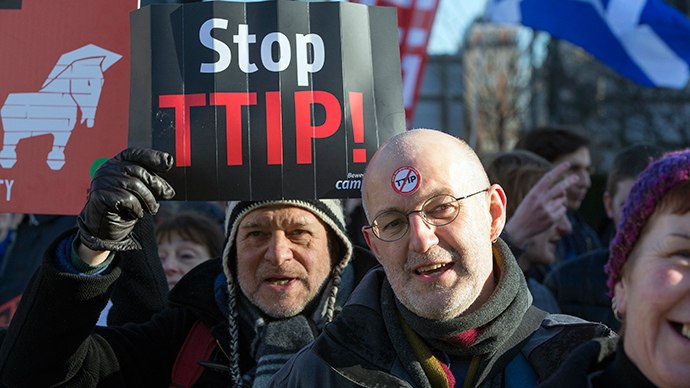 “These rules have never been, and will never be, set by trade deals such as TTIP,” the committee said. Speaking to RT on Wednesday, the leader of Britain’s Trade Union Congress (TUC) said she welcomed the committee’s report. TUC General Secretary Frances O’Grady said MPs were correct to demand Britain’s NHS and public services be protected by legislation incorporated into TTIP, rather than blindly relying on EU commissioners’ assurances. “The TUC also agrees with the MPs’ call for a sector-by-sector assessment of the potential risks and benefits of TTIP,” O’Grady said. She said the government had a duty to respond to MPs’ demands relating to the ISDS provisions in TTIP. The ISDS clause, as it currently stands, appears “undemocratic” and disproportionately beneficial for “foreign investors,” O’Grady said. Campaigns and policy chief at Global Justice Now, Polly Jones, told RT the committee’s report highlights concerns on TTIP shared by many UK citizens. She said that secrecy relating to TTIP, the “ISDS, the lack of evidence to substantiate the benefits, and the threat to public services” are foremost in people’s minds. She called upon the next government to address the serious concerns highlighted in the committee’s report.